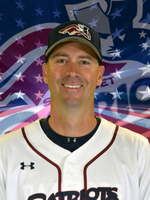 Jodie enters his seventh season as manager and 16th overall season with the Somerset Patriots organization. He carries a 487-336 (.592) record in his first six seasons as a manager, including a 2015 Atlantic Championship. His teams have won seven of a possible 12 Half Championships and have made the playoffs in each of his seasons at the helm. The South Carolina native was named the 2015 Atlantic League Manager of the Year after his team not only won the league’s title but recorded a historic 50-win first half: the most wins in any half by any team in league history. Additionally, Jodie’s 2013 team set a franchise record with 90 wins and he became the fastest manager in league history to win 250 games, setting that mark on August 26, 2015. Jodie first joined the Patriots organization in 2003 as a player. That year, the former New York Yankee southpaw went 12-5 with a 3.78 ERA en route to an Atlantic League championship. He also made 10 starts with Somerset in 2005 before he announced his retirement. Jodie then became the team’s pitching coach in 2006 – a position he held through 2012 – and the Director of Player Personnel from 2007 through 2013. He won two additional championships as a coach in 2008 and 2009. Jodie is the longest-tenured coach in the Atlantic League and is tied with Mark Mason (York) as the league’s longest-tenured manager.